Palliative care is a new phenomenon in China. While demand is huge, hospitals are facing challenges in introducing this concept to a society where traditional filial piety still holds sway, especially given a lack of funding and policy support. 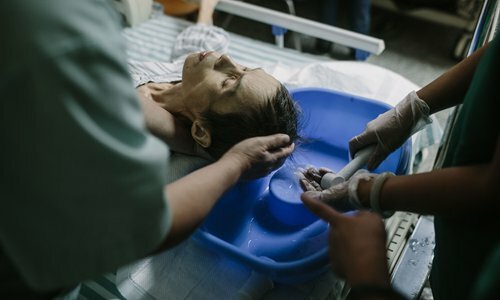 Every patient who wants to live out what remains of their life in the hospice ward of Beijing Haidian Hospital first needs to get their relatives to sign a document saying that the patient doesn't want doctors to try to cure them any more and that they do not want to be resuscitated. "This is to guarantee that the patients can have a less painful and dignified death," said Qin Yuan, the oncologist at the hospital who runs a hospice, or palliative care, ward. The hospital started offering hospice services in March, one month after the country's top health authorities called for such care to be promoted nationwide. Since then, its six beds have been home to over 60 terminally ill patients. Though demand for such care is huge, there have been difficulties in introducing this concept in terms of funding, policy support and cultural acceptance. For a long time, Qin, 54, was so depressed that she considered abandoning her work. "I felt powerless. As an oncologist, whatever I do, I can't prevent death from taking my patients away. I have to see them dying almost every day after going through lots of suffering," she told the Global Times. One time a patient's relative complained that her patients die even though they spend all their savings and suffer unbearable pain. The People's Daily reported in 2016 that some 2.7 million people die of cancer in China annually and they generally spend more than 70 percent of their total savings on treatment. But Qin's career was given new purpose after she got to know more about hospices. In 2012, she had the opportunity to observe such services in Taiwan. Qin says that this experience taught her that death doesn't have to be a horrible thing, and that people can die with dignity and do so while retaining some sense of agency. During a discussion panel held during her trip, a local lecturer asked the visiting doctors to pick a way to die from four choices: sudden death, organ failure, cancer or dementia. Most of them chose sudden death. An ICU doctor revealed that he once told his family members not to send him to the ICU if his life is ever in danger. "Have you noticed that modern medicine's main focus is stopping people from suddenly dying?" said the lecturer. This trip was a revelation to Qin. From then on, she understood her role as being to either cure a patient or help them die comfortably if a cure is impossible. "I never learned about this on the mainland. We don't have such education at school," she said. She has tried to help her peers on the mainland to understand this idea ever since then, but few of them have been receptive. 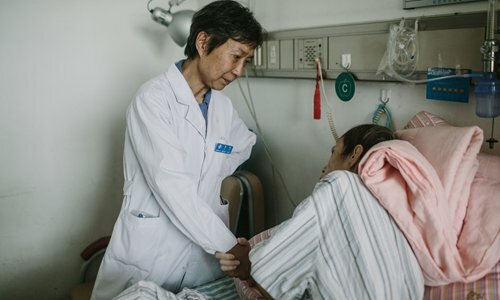 But when she heard that the Beijing health authorities were considering testing hospice services in the city, she went straight to the hospital's head to ask him to open such a ward. After the national health authorities made their announcement in February, Beijing announced that it would have more than 10 hospitals pilot palliative care wards. To her surprise, Dean Zhang Fuchun accepted her proposal without hesitation. "Opening hospice wards will cut into our profits," explained Qin. Under the current system, hospitals can only charge patients fees for treating their physical symptoms but charging fees for psychiatry and spiritual support is banned. Chinese society traditionally teaches children to show filial piety, so people worry about how they will be judged for putting their parents in a hospice instead of taking care of them themselves. Qin once cared for a 96-year-old patient who wanted a peaceful death. But his son worried that if he gave over his father's care to a hospice, people in the neighborhood would look down on him. "If I don't rescue my father, how can I face my relatives and friends?" he said. Qin tried to help them figure out a solution. She suggested the son create a WeChat group to gather together all his relatives and, when his father is coherent, film a video in which the elderly man explains his desire to stop receiving life-extending intervention treatment. Other staff members also try to guide children to think about the situation from their sick parent's perspective. However, many still change their minds after signing the release form. When his son announced that he wanted his father to start receiving treatment again, the 96-year-old tried to stop receiving injections and would yank out his IV tube. In the end, his son yielded and moved him out of the hospital completely. The elderly man died shortly after. According to Qin, they often have to help patients persuade their children to respect their own decision to stop receiving treatment. "Young people, especially those who have been educated overseas, find it easier to accept. People from older generations are more stubborn," Qin said. She noted that in many countries, including those in the West, doctors are obligated to tell patients their actual condition. But in China, doctors often tell patients' relatives about their illness and keep the information from the patient themselves. "In this way, patients who are blind about their own situation are unable to make own decisions," she said. The death of the British infant Charlie Gard made international headlines in July. While his doctors believed the best thing for the baby was to withdraw life support, his parents wished to fly him to New York for experimental treatment for the genetic disorder that caused him to suffer brain damage and muscle failure. The controversial case drew the attention of Pope Francis and Donald Trump, however eventually the European Court of Human Rights ruled in favor of the hospital and life support was removed on July 27. Gard died the following day at the age of 11 months, 24 days. The case aroused debate on the right to die, the role of relatives' decisions in a patient's care and the extent of doctor's right to intervene in decision-making. Qin says that on the mainland, the power in this kind of situation is in the hands of patients' direct relatives, which can lead to conflicts between family members. Wang Jinhui, 54, is helping to care for her terminally ill twin sister in Haidian Hospital's hospice care wards. The family had a meeting early on to agree upon what should happen to the woman. "The decision was hard. But seeing that she is being tortured this much, we wanted her to suffer less," Wang told the Global Times. According to Wang, there were two paths offered by the doctor. One way would cause less pain but a quicker death, and the other would prolong her life and her pain. Her siblings all chose the first option, but her son disagreed. Eventually, his mother said she agreed with him. "While we disagree, we respect her son's opinion," she said. Qin noted that in countries with mature palliative care, hospices usually receive patients with a few months left to live. However, due to her shortage of staff and beds, she is only able to admit patients with around two weeks of life left. And if a patient proves to be in a stable condition and can get sufficient care at home, they will be discharged. 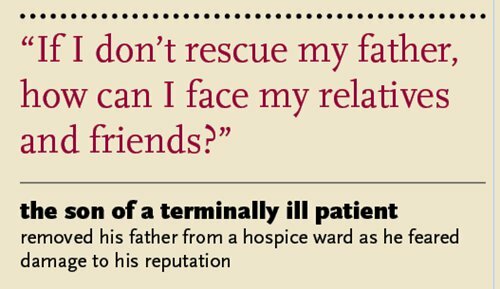 Working in the hospice wards is considered to be an undesirable post in the hospital. Cash bonuses are lacking as they are unprofitable and staff members' workload is high as they need to take care of patients' bodies and psychological state. Since the wards opened, three nurses have quit Qin's team. A relative of patient in the hospice told the Global Times that she paid the hospital 4,000 yuan ($560) for her mother's palliative care and it hasn't yet all been spent. When her mother was receiving treatment in another hospital, this money would have disappeared in no time at all, she said. Qin said she is the only doctor working permanently in the hospital's palliative care wards. Other doctors do not want to take on this role as they cannot heal people who have asked not to receive treatment. Moreover, they are unable to get professional recognition for this work as it is a brand new field on the mainland. In other countries, such wards are equipped with professional psychologists. Without sufficient funding, Qin has asked her friend to take on this burden part-time. When the hospital announced the pilot program in March, they said they would decide its future after six months. This deadline will arrive next month. Dean Zhang Fuchun said that while the palliative care wards are a good thing, the hospital cannot sustain them without help. "They need support from society, the hospital and more importantly the government," he said.